Commercial real estate prices are soaring across the nation, meaning it’s getting harder for businesses to find new affordable office space. Most common compromises include renting out nearby offices or commercial property away from the city, where prices are more affordable, or signing up for lengthy (and costly) lease agreements. However, your company could save plenty of additional overhead by making the most of the office space that you already have. Here are a few ideas to get the creative juices flowing and start creating some space out of nowhere! If your office building spreads over two floors, you can make the most of the vertical space are under and within your stairs. If you have the budget, think about setting up stair drawers: they will become the perfect storage for files, materials or inventory that is not used regularly. Also, think about making the most of the space under the stairs: book shelves, desks and proper office units are clever ways of optimizing stair space without having to hide your online printing equipment away somewhere inconvenient. Include plans to hide wires in your office design plans. This will lead to a much more enjoyable and aesthetically pleasing office environment. Wires are unsightly, to say the least. But, they are also office hazards if left wherever. 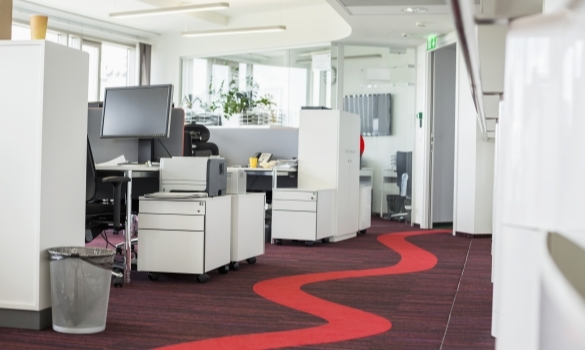 Employees can trip over wires that are not tucked out of the way. Wires that are not hidden can also be frayed or otherwise damaged from coming into contact with works and other office furniture. Keep this in mind and include plans to hide office wires when creating your office designs. Does your office building have tall ceilings but relatively limited floor space? You should definitely start to think vertically and figure out ways to even double up the available space. You won’t need much apart from the initial investment: the structure being internal, you won’t even need to worry about a mezzanine floor planning permission. Mezzanine floors are particularly indicated for business lofts and commercial studios, making for great office areas. You don’t need your shelves and bookcases to be too wide. Always opt for bookcases that are as tall as possible, even all the way to the ceiling if you have many books and memorabilia that you don’t know where else to place. Some of the smartest bookcases out there come with drawers to the bottom that allow you to make the most of an area that’s usually the least convenient to use. They also provide a useful place to store everything if you’ve got junk you do not want to part with just yet. The CEO’s office is possibly the office where you can save the most space by making a few clever adjustments. For instance, many top CEOs have couches, futons or other furniture in their office. For the amount of time they spend in the office, they should. A clever trick is the Murphy bed, which allows you to pull up the bed when you don’t need it and make the most of that office floor space too. If you’re opting for a more traditional office futon instead, you might also want to make the most of the space beneath it simply by adding storage boxes for those samples you might not need for a few weeks. If you want your office to show your company stays up-to-date on current trends, consider incorporating some of these office design ideas into your workspace.